CASSIDIAN’s Warrior21TM prod­uct sig­nif­i­cant­ly boosts the advanced devel­op­ment of inter­na­tion­al sol­dier mod­erni­sa­tion pro­grammes. CASSIDIAN is the new name of the Defence & Secu­ri­ty divi­sion of EADS. 1 March 2011 – Cas­sid­i­an has won a con­tract from the Swiss defence pro­cure­ment author­i­ty Arma­su­isse for the advanced pro­duc­tion engi­neer­ing of the IMESS pro­gramme (Inte­grat­ed and Mod­u­lar Engage­ment Sys­tem for the Swiss Sol­dier). The vol­ume of this order is in excess of 20 mil­lion Swiss francs. Switzer­land expects Cas­sid­i­an Warrior21™ prod­uct to deliv­er sig­nif­i­cant capa­bil­i­ty enhance­ment, future via­bil­i­ty and mod­u­lar­i­ty in the infantry sec­tor. It will give the Swiss Army one of the world’s most pow­er­ful advanced sol­dier sys­tems. It will fit smooth­ly into the Swiss Army joint recon­nais­sance, com­mand and action forces. It can also be inte­grat­ed with sys­tems already in use. 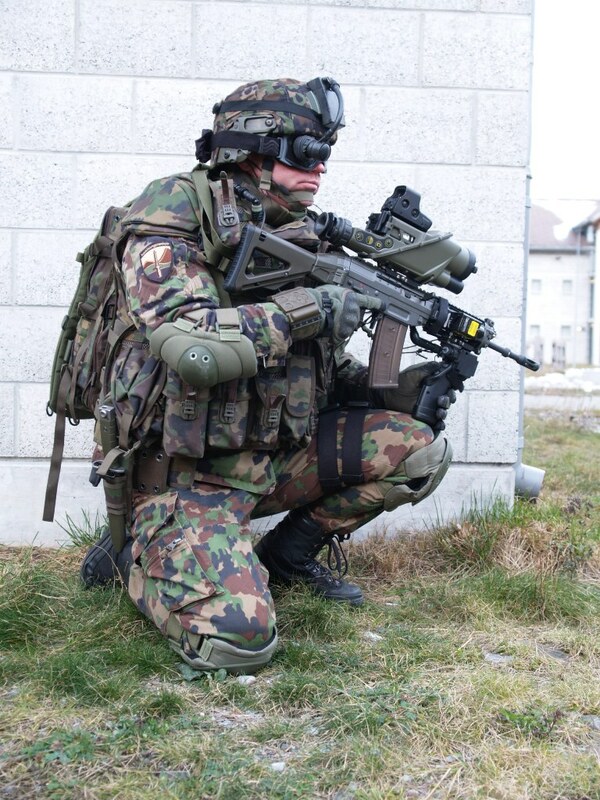 IMESS pro­to­types based on War­rior 21TM have been prov­ing their worth since 2007 in numer­ous field tests and in pre­sen­ta­tions to high-rank­ing rep­re­sen­ta­tives of the Swiss Army. The present con­tract takes this expe­ri­ence as a basis for upgrad­ing the exist­ing sys­tems to pro­duc­tion stan­dard and sup­ple­ment­ing them with fur­ther, pro­duc­tion-ready IMESS sol­dier sys­tems. To ensure com­mand-and-con­trol capa­bil­i­ty on high-mobil­i­ty oper­a­tions, the con­tract also pro­vides for the equip­ping of com­bat vehi­cles – includ­ing the tac­ti­cal mil­i­tary vehi­cle DURO and the armoured assault vehi­cle PIRANHA – and their inte­gra­tion into the IMESS net­work. The advanced pro­duc­tion engi­neer­ing con­tract will opti­mise var­i­ous capa­bil­i­ties of the Warrior21TM IMESS ver­sion by employ­ing more effi­cient and pow­er­ful com­po­nents, many of which are ded­i­cat­ed new devel­op­ments. It address­es tac­ti­cal com­mand-and-con­trol capa­bil­i­ties from com­pa­ny lev­el to indi­vid­ual sol­dier lev­el, cov­er­ing com­bat vehi­cles, the use of opti­mised com­mu­ni­ca­tion media, a sig­nif­i­cant­ly improved weight and ener­gy bal­ance through the deploy­ment of new and/or opti­mised com­po­nents, enhanced sit­u­a­tion­al aware­ness and nav­i­ga­tion through the use of head/helmet mount­ed dis­plays, and bet­ter night fight­ing and recon­nais­sance capa­bil­i­ties through such means as nav­i­ga­tion aids and video stream­ing of night weapon sights (optron­ics). A con­sid­er­ably more pow­er­ful and ener­gy-effi­cient ‘elec­tron­ic back­bone’ with reduced com­po­nents and reli­able cables and con­nec­tors is being inte­grat­ed to han­dle the heavy loads encoun­tered in infantry oper­a­tion sce­nar­ios. The Warrior21TM Pow­er­Con­troller enables a wide range of ener­gy sources to be con­nect­ed in order to secure a con­stant pow­er sup­ply. Thanks to its mod­u­lar archi­tec­ture, Warrior21TM pro­vides numer­ous stan­dard inter­faces to sen­sors, as well as mod­ules for link-up with exter­nal sys­tems. With its War­rior 21TM prod­uct and its con­tin­u­ous research and devel­op­ment invest­ment in the area of future sol­dier sys­tems, Cas­sid­i­an is sig­nif­i­cant­ly pro­mot­ing the advanced devel­op­ment of inter­na­tion­al sol­dier mod­erni­sa­tion pro­grammes. Cas­sid­i­an, an EADS com­pa­ny, is a world­wide leader in glob­al secu­ri­ty solu­tions and sys­tems, pro­vid­ing Lead Sys­tems Inte­gra­tion and val­ue-added prod­ucts and ser­vices to civ­il and mil­i­tary cus­tomers around the globe: air sys­tems (air­craft and unmanned aer­i­al sys­tems), land, naval and joint sys­tems, intel­li­gence and sur­veil­lance, cyber secu­ri­ty, secure com­mu­ni­ca­tions, test sys­tems, mis­siles, ser­vices and sup­port solu­tions. In 2009, Cas­sid­i­an – with around 28,000 employ­ees – achieved rev­enues of € 5.4 bil­lion. EADS is a glob­al leader in aero­space, defence and relat­ed ser­vices. In 2009, the Group – com­pris­ing the Divi­sions Air­bus, Astri­um, Cas­sid­i­an and Euro­copter – gen­er­at­ed rev­enues of € 42.8 bil­lion and employed a work­force of more than 119,000.